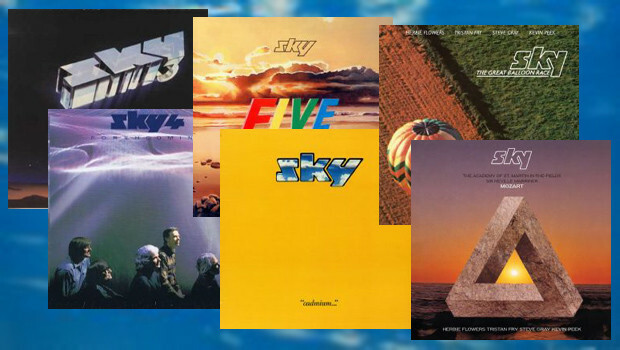 At the end of last year I reviewed the first two fruits of Esoteric’s remastered reissues series of the complete works of Sky, the Anglo-Aussie classical/rock crossover band formed in 1978 by classical guitar maestro John Williams. Probably the zenith of their recordings, Sky and Sky 2 are essential listens, but what of the rest of the band’s catalogue? Well, now that the other Sky albums have all been re-released it seems right to have a look at those too. I must admit to not being previously familiar with a number of these releases so it has been in part a nostalgic trip down a particularly leafy memory lane from 30 years and more ago and part voyage of discovery that has uncovered a number of previously undiscovered gems. Despite the first two releases being such fine albums in their own right there is much to enjoy throughout the rest of these releases and it is far from being a journey of diminishing returns. Each one of these Esoteric reissues is – as they always are – lovingly realised with pristine remastered sound and come with original sleeve notes plus additional photos and essays from Sid Smith. They are all lovely things. Except for The Great Balloon Race and Mozart they are all double disc affairs with a bonus DVD (except Sky Five Live which is in the original two CD format) and some feature extra tracks. At the start of this chapter we have a change in personnel. 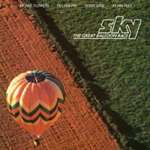 After Sky 2 in 1980 ex-Curved Air keyboardist Francis Monkman suddenly flew the coop and, as he wrote a large percentage of the material for the first two albums, a subtle shift can be felt on the subsequent releases via his replacement Steve Gray, a British composer and jazzer of some pedigree who stayed with the band until they finally split in 1995. Sadly, Steve died in 2008 but these albums are a testament to his compositional and performing skill. The new formation quickly entered the studio and in 1981 Sky’s third offering was released. It finds the band staying close to the formula of their first two releases but the excitement is somewhat diminished and the music sounds a little uninspired with nothing much new on offer. The band plays with the same virtuosity but it just sounds a bit too much like a case of more of the same. The stately guitars of Grace is a lovely way to start but all too soon it moves into the more upbeat soft rock of Chiropodie No.1, a formula which continues into West Wind and later Moonroof which is a nice tune, the guitar as raucous as Sky get. Williams’ classical guitar remains integral but the music seems to lack some of the previous inspiration, although still played with enthusiasm and sounding just like you imagine Sky should. Most of the writing on this one comes from bassist Herbie Flowers with Gray, guitarist Kevin Peek and percussionist Tristan Fry also providing pieces, alongside a young upstart called George Frederick Handel whose Williams arranged Sarabande is just lovely and one of the most sublime pieces in the Sky canon, classical guitars mixing with harpsichord, bass and melodic keys, drums entering for the build towards a fitting climax. Fry’s Connecting Rooms is filled with a sense of the mountain freedom by which it was inspired. I often find Sky drum parts a little plodding, as here, but what surrounds then retains the interest, a beautifully meditative guitar section changing the pace for the second half. Gray’s Sister Rose is part Spanish, part funk. Some of it works although not 100% but Gray’s jazzy flair is evident and Williams’ contribution remains the icing on the cake. Williams leads on the gentle Hello with fine piano accompaniment before things spread out with drums and Peek’s sweeping electric guitar. Flowers’ ubiquitous tuba gets an airing, paired with harpsichord this time for Dance of the Big Fairies which is good natured fun and another nice tune but Meheeco is the best original here. Starting as dawn breaks with faraway bass, the feel of a vibrant Mexican day builds and this is an exciting ride, Flowers’ Keep Me Safe and Keep Me Warm, Shelter Me from Darkness bringing the album full circle and closing it out calmly. The DVD is a more than worthy addition to this set and sure to draw in the potential purchaser. Cut with interior and exterior images of the wonderful setting, we get Sky performing in the extraordinary surroundings of Westminster Abbey in February 1981 for a benefit to celebrate the 20th anniversary of the founding of Amnesty International, the event also acting as the launch for Sky 3. Flowers is suitably dressed for the occasion in jacket and tie as Sky reveal their full potential in a live environment. The tracks from Sky 3 certainly benefit and it is nice to see Gray – a very different player to Monkman – at work as it shows exactly what he brings to the material and how well he fits into the band. Again, Handel’s Sarabande is perfectly fitting for the location and shows the true skill of the performers. The drums seem a little low in the mix, possibly to avoid shaking the majestic old building to rubble, but this was always going to be a very different show with the audience sitting sideways on in the choir of the abbey, the band (as ever) reading the music as they play. Kevin Peek adds a bit of fire with electric guitar to stop the whole thing becoming too polite – interesting to see him playing without a pick, classical style – and Sahara from Sky 2 can still give you goosebumps. From the same album Dance of the Little Fairies is still great fun but the run out of FIFO is one of the highlights, split screen used to good effect. Peek and Williams get a showcase in Recuerdos de la Alhambra and Fry leads on marimba for Saint-Saens’ The Swan followed by Flowers tubafest The Whale. With nothing from the debut album in the main set, Sky 2 also provides the lovely Scipio and Hotta where Gray, Peek and Fry show what they can do. No surprise that the encore is Toccata, greeted with a cheer it clearly sends everyone home happy. Overall a worthy and entertaining performance in an extraordinary setting. In the main, this album is a nice re-focusing of the material with some interesting arrangements of classical material alongside the original adult orientated stuff. There is a more pronounced classical feel than previously featuring, almost exclusively, arrangements of the writing of others, Peek providing the only piece written by a member of the band. This gives the album a different perspective and despite being more about reinterpretation it is still an enjoyable listen. Masquerade is a beautiful and powerful opener. The familiar theme of Ride of the Valkyries is somewhat sanitised and not the ‘sturm und drang’ showstopper it should be, Gray’s tinkling piano not quite hitting the right feel. Berlioz’s March to the Scaffold from his Symphonie Fantastique (previously a single B-side for Sky in 1980) makes a welcome reappearance. The classical feel continues through Mikis Theodrakis’ To Yelasto Pedi (the theme music to the film Z) but with a Greek feel this time and great use of harpsichord. Ravel’s Waltz No.2 starts with a sinister edge but resolves into a rich piece based around Gray’s piano and the band return to J.S. Bach, the source of their greatest popular success, for Fantasy, making it a bombastic and exuberant affair with harpsichord again to the fore. I loves me some JSB and this works a treat. Peek’s piece My Giselle fits in well, a sombre classical guitar piece that builds and expands nicely and deserves its place. Tristan Fry’s marimba leads the way on the rhythmic Xangô while Fantasia is bright and vibrant, Gray’s lovely arrangement of Hoagy Carmichael’s Skylark bringing things to a wonderfully relaxed conclusion with JW taking the melody line. 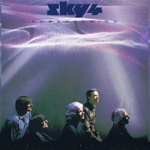 Sky 4 is certainly one of the better of the later releases, the source music well chosen and beautifully arranged to do it full justice. The playing is (of course) superb and all in all it is a joy to listen to. Sky are sometimes tarred with the “cod-classical” brush but this album shows just how skillful they were in translating some of these pieces into a new setting for a new audience. Three of the seven tracks on the bonus DVD, the 1982 BBC show Night Music, come from Sky 3 with only a great My Giselle from Forthcoming. West Wind is a good opener and a gorgeous acoustic version of Lennon and McCartney’s Fool on the Hill, the studio version of which later appeared as a bonus track on Cadmium, is a showcase for Williams and Peek. The recorded in the studio set suits the band and it’s another good performance and a fine visual record that gets really close to the players making it my favourite DVD here. They’re still reading the charts and it’s fascinating to watch consummate professionals doing this; did they rehearse or just pitch up and play the dots? All of the band get to introduce a number and it’s a relaxed feel. Tuba Smarties gets the audience clapping along, Fry keeping time with one hand whilst playing trumpet with the other. Peek excels on Sister Rose with some slapping from Flowers and a lovely nostalgic Watch With Mother sees Fry manning the marimba with accompaniment from Gray. A fantastic opportunity to watch Williams’ prodigious talent, a resounding Meheeco winds up the short but sweet half hour or so. 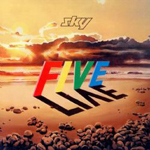 The double LP Sky Five Live (recorded in Australia where the band maintained considerable popularity throughout its existence) is a nice overview of where Sky were at that time with the wise decision not to include Toccata. Additionally – and very pleasingly for a live release – this is not a best of as the bulk of the running time is given over to new material, otherwise unavailable on album. This comes in the the shape of the sprawling yet compelling The Animals which is not taken from the work of Camille Saint-Saëns whereas the delicate The Swan is, performed here by Tristan Fry on marimba. The flip side is the bizarre singalong that is Flowers’ The Bathroom Song but there are also the rockier KP1 and KP2 from Peek showing that the band could cut loose when they wanted to. Williams adds the meditative Antigua but my favourite of the debut tracks is without doubt Peek and Williams’ beautiful and enigmatic Japanese influenced Sakura Variations. Of the remaining pieces, Sky 2 is heavily featured but there are no tracks from the debut or Sky 4 and only one from Sky 3. The audience applauds politely between tracks and can be heard laughing at Flowers’ antics during Dance of The Little Fairies but this is not a riotous affair, those present happy to sit back and listen. It may be a sanitised experience when compared to other live works but the enjoyment here is in the playing which is sublime throughout. The fact that so much of the material is new also gives it a unique quality in Sky’s catalogue and is one of their most impressive releases. The sixth album, Cadmium, was released in December 1983 and returned to the format of original material, although Prokofiev’s Troika (from the Lieutenant Kijé Suite suite) will be familiar, as will the bonus track of Lennon and McCartney’s Fool On The Hill. This album also saw the first time commissioned compositions from outside writers were included with Kevin Peek’s friend (and Cliff Richard collaborator) Alan Tarney providing two original tunes. The band all get writing credits except John Williams whose name is absent except for a co-write on another bonus track, Why Don’t We. The material is enjoyable and as well played as you’d expect with some lovely melodies and it feels that Sky are in a rich groove now having established themselves and proven time and again that they could produce instrumental albums of real quality that didn’t need to rely on reinventions of the classics. Fayre, Girl in Winter and Return To Me are very pretty, the mood changing for Gray’s lengthy Mother Russia which moves through a number of moods and contains some wonderful playing. A brace from Flowers gives us the quirky and fun Telex From Peru and slightly sentimental The Boy From Dundee. Peek adds some rocky energy with Night, Fry’s beautiful Then & Now calming things down again. Son Of Hotta is not as rumbustious as its namesake from Sky 2 but a good way to finish the album proper. Of the bonus tracks the extended version of Troika is always going to be a good thing. The unusual (for Sky at least) blues swing of Why Don’t We works well with some rawkus soloing from Peek, this reissue ending with the lovely acoustic duet of Fool On The Hill. Sky toured extensively in 1983 and recorded their show at London’s Drury Lane Theatre on Christmas Eve for broadcast on BBC to mark the release of Cadmium. This time they open with Toccata and take in tracks from Sky 2 and Cadmium including a seasonal rendition of Troika complete with fake snow and Santas. It goes all panto with Fry joining the kids in party hats in the front row to clap along to guest artist Patrick Rös and his Calypso Rags and Bones, Patrick staying on to sing When the Branch is Green with the band to make for a bizarre 10 minutes that underlines that Sky were not your average rock gig, as does the fact that for a lot of the show all of the band are sitting down! Gray’s arrangement of Oh Little One / Courons A La Fete more than earns its place, however Flowers’ tuba section is getting a bit much now. It still gets a cheer and the panto feel returns as they go into a brass-led Rudolph the Red-Nosed Reindeer which culminates in one of the Santas knocking a sax playing Gray unconscious. You couldn’t make this up! It’s a fun 50 minutes featuring a stunning selection of colourful jumpers (both on the stage and in the audience), the percussion version of Carillon a nice way to finish. As an extra extra the band can be seen playing Troika on Val Doonican’s 1983 BBC Christmas show. Overall Cadmium is a strong album but it would be the last Sky album to feature John Williams who left in February 1984, his 5 Year Plan at an end as he returned to his classical work. The band were strong enough and in the right place commercially to carry on without their figurehead and best known member who was also the cornerstone of their sound. Williams’ departure damaged Sky’s profile, he was the band’s biggest star and live draw despite their efforts to present themselves as a partnership of equals. Deciding to continue on as a quartet Sky regrouped and recorded The Great Balloon Race with guests helping to fill out the sound and move the music in new directions. 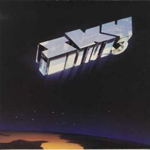 A key track and a departure for the band is Tony Hymas’ Desperate for Your Love. A talented keyboardist and composer who had worked with Jack Bruce and Jeff Beck, Hymas’ spoken words are set against a dissonant backing which moves into an unusual downbeat tune. Clare Torry (known for Pink Floyd’s The Great Gig in the Sky) also provides some vocals, the piece moving off piste for a strange ending. There is, expectedly, less classical guitar on the album, with Roy Aspery’s flute and sax, pan-pipes from Adrian Brett and additional guitars from Lee Fothergill. Aspery and Fothergill subsequently toured with the band. Harpsichord leads out on Allegro with Peek’s electric guitar moving things to new pastures. The drums are again a little one dimensional but the sounds of Peek’s Australian homeland shine through on The Land, although the synthesized didgeridoo at the end is a little strange. Flowers’ strident Peter’s Wedding goes through several short movements and benefits from the additional sax but again it’s the additions which leave you scratching your head, synthesized church bells always sounding a little wrong. Elsewhere Flowers solos supported by odd synthetic vocals, Tull-like flute and Wild West piano. The title track starts in as floaty a fashion as its name suggests but gets more forthright as it progresses, the wind clearly picking up. The Lady and the Imp sees a piano intro lead into a sprightly Irish jig with jazz thrown in before a very different and sedate ending while Caldando is lilting acoustic guitar with pan-pipes for good measure. Named after the location of Peek’s farm in Australia where it was recorded, Roleystone is the most rocking part of the disc, Night Sky a straightforward and soothing way to finish. The Great Balloon Race is a strange anomaly in the Sky catalogue and I wasn’t previously familiar with it. It did nothing for me first time through but on deeper listening there is much to enjoy and it certainly has its moments, such as Desperate For Your Love. Not their best but no slouch either and worth a hearing, it stands apart and sees the band trying new things so is to be commended for that. 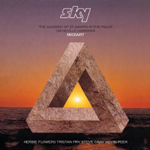 Inspired by the bicentenary of the death of Wolfgang Amadeus Mozart, the final Sky album was recorded in 1987, a selection of pieces composed by the man himself featuring the Academy of St. Martin in the Fields, with whom Fry also worked, conducted by Sir Neville Marriner. The band seem to be an appendage to Mozart’s music and the orchestral might of the Academy yet, oddly, this release earned them their highest ever U.S. chart placing. The Overture from Le Nozze di Figaro comes across a little too Hooked On Classics and Herbie’s tuba seems to be struggling to keep up on Horn Concerto No.4 while the almost discoed up A Musical Joke (a piece familiar to all show jumping fans of the ’70s) is just a little, er, strange. Steve Gray gets the only band writing credit (shades of “additional material by W.A. Mozart”!) on a jazzy reworking of Rondo Alla Turka to finish. The band played a single concert in November 1987 to promote Mozart, with Paul Hart added, and then went quiet. 1990 saw a one-off show at the London Palladium with another TV concert in early 1991 featuring new compositions by Peek, Gray and Hart which were apparently never recorded in the studio. In 1991 Peek departed due to other commitments and his full-time residency in Australia and was replaced as Sky’s main guitarist by Richard Durrant who joined the band for a comeback concert in September 1992 at the Barbican in London. They toured the UK again in 1993 but at smaller venues than previously and their last performance was at an RAF tribute concert in May 1995. Although never formally disbanding Sky has not been active since and the deaths of Steve Gray (in 2008) and Kevin Peek (in 2013) have made any further appearance unlikely. 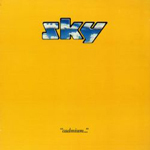 Sky were a fine bunch of musicians, successfully assembled from disparate areas, who produced many fantastic moments over a recording career that crammed in a great deal despite probably going on slightly longer than it needed to. That said, all of the albums have something to commend them. 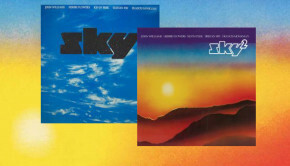 The skill and attention to detail in the remastering and repackaging, the additions from Sid Smith (based around interviews with Herbie Flowers and Tristan Fry) and additional extra tracks and DVDs certainly make these Esoteric releases the definitive editions and a fine reminder of what a great band Sky were. These albums are not simply an exercise in nostalgia and well worth your attention.